Invisalign is an orthodontic system that uses a series of clear, plastic, removable aligners to gradually shift misaligned teeth into the proper position. This treatment offers a subtle alternative to visible metal braces, which appeals to many patients. The average treatment time of Invisalign is usually a bit longer than it would be with conventional braces, but the end result is the same — a confident, beautiful smile with well-aligned teeth. Most patients who could benefit from metal braces can indeed undergo treatment with Invisalign. Parents of teens should be aware of the fact that missing or damaged aligners will delay treatment and increase the cost of Invisalign. Removable braces are best for older, responsible teens. The only way to find out whether or not you are a good candidate for Invisalign is to schedule an appointment with your provider. 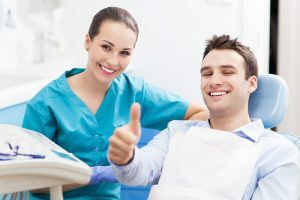 During a consultation, your dentist will examine your bite and then the two of you will discuss your budget, timeline, and goals with orthodontic treatment. If Invisalign is a viable option, you can look forward to getting started right away! Removable aligners increase convenience, allowing you to eat what you like without fear of popping off a wire or bracket. Brushing and flossing are simple with removable aligners. Fewer visits to the dentist are required with Invisalign compared to traditional braces. Smooth plastic is more comfortable than fixed metal brackets and wires. Invisalign reveals straight teeth and beautiful smiles! If you are interested in enjoying these and other benefits of Invisalign, schedule an appointment with your nearest provider to find out whether or not you are eligible for this treatment. Straight teeth promote better oral and overall health, so don’t wait to get started if you need braces. Market Heights Family Dental offers comprehensive dental care and earned the title of Preferred Provider of Invisalign in 2017. To learn more about this clear aligner system or to discuss your or your child’s options in orthodontics, please do not hesitate to get in touch with your dentist at 254-699-3565.